A gemstone is brought to life by the artisans who polish it, just as Michelangelo did with the David—only on a different scale. To me, a polished gem is made even more beautiful by understanding it from the inside out, from its crystal structure to the symmetry of its facets. who can provide you with the historical significance of vintage pieces, and those who bring earth-born rocks to life as the gems we wear to signify eternal love. Diamond grading is just one of the many skills possessed by a gemologist! The Gemological Institute of America is known to be one of the toughest and most thorough diamond grading services in the world! aside from color. To the untrained eye real, synthetic and imitation rocks can be indistinguishable. But to a gemologist? There are glaring differences- they may just need their loupe! Or in the case of a really good enough synthetic, a little help from a laboratory to see them! Without the help of gemologists, consumers wouldn’t know what they own, what they are buying, or what is being traded. Just as in any industry, what makes a good gemologist is experience, not just their certification. So, when you turn to a gemologist to appraise your family heirloom, to identify a gem you picked up overseas, or to assess the quality of a diamond for “the one,” make sure you align your needs to the gemologist’s experience and specialization. My mantra is that we are all diamonds in the rough striving to become the polished gems we are meant to be. In my own “polishing process,” I was a wedding and studio photographer at one point. I assisted a jewelry photographer at an annual show, and one day I realized I was more drawn to the jewelry than the photography. 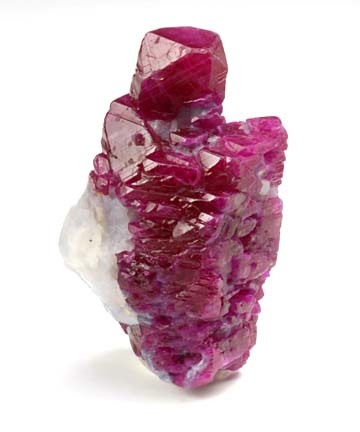 A gemologist can differentiate similarly colored species of gems by identifying specific characteristics that are unique to each gemstone. When I hit my quarter-life crisis, I knew I needed a career change. As I would not be able to get a job in the jewelry industry on my blossoming beading skills alone, I found the Gemological Institute of America and signed up for their Graduate Gemologist program. Six months later, I could legitimately tack “G.G.” after my name on business cards. For the past six years, I have developed and honed my skills working as a diamond grader at the GIA, in the service department at , and currently as Team Leader at Casting House, in Chicago, Illinois! Each of these experiences has polished another of my facets and brought me here to help you learn about gemology. I hope to share my love of gemology and jewelry, answer commonly asked questions, and delve deeper into specific topics. First, we’ll discuss the four C’s behind buying a diamond. From there, I have a growing list of topics I plan to cover, from trending colored stones to octahedrons, from how diamonds chip to the properties of different metals. Jewelry is an intrinsically beautiful expression, but one that is made even more beautiful by understanding the science behind it—and that science is gemology. Have a question for Alicia? Send her an email!